IN THE ten months before the outbreak of the Second World War, 10,000 children embarked on a traumatic journey from Germany. Clambering aboard sealed trains, most travelled alone and left weeping parents behind as they set off to find freedom in a strange land. These were the children of the Kindertransport, whose tearful flight to Britain ensured they cheated the gas chambers. This week a play at the Bank of Scotland Children's International Theatre Festival will dramatise the loneliness, fear and excitement that gripped the youngsters who made this trek. But, as the play's title makes plain, The End of Everything Ever will deliver the emotional agony that followed the defeat of the Nazis, when most of the children discovered that their families were dead. It is nearly 70 years since hundreds of these refugees, the majority of them Jewish, found homes in Scotland. Prompted by the play, three of the survivors - 84-year-old Rosa Sacharin, 79-year-old Isi Metzstein and 75-year-old Dorrith Sim - recently met up in Glasgow to share their memories. Each of them has a remarkable but very different tale to tell. Much of what they say is about loss, but along with heartache for families who disappeared there is also defiance and courage, quick-wittedness and excitement. The emotional impact such an event had on these children is almost unimaginable. Picture the youngest of these witnesses, Sim, then aged seven, crying and clutching her favourite toy as she hugged her parents at Hamburg station in the summer of 1939. Or consider the emotions of the eldest of the three, Sacharin, who would never see her father again after he was imprisoned in 1936. Although her mother survived the war, the stress of their long separation ensured that the relationship between the two was never the same when they were finally reunited. By contrast, every member of Metzstein's family survived. He conjures up images of delighted children running wild as he went charging around the luxury liner that carried him and his companions to freedom. But what unites all three is the experience of living though what Metzstein calls "the aberration" of Nazism. Their clear memories and articulate tongues vividly recapture Germany in the dark valley of the 1930s. Take Metzstein, who grew up in Berlin. An intelligent boy, he was small enough to be ignored by the thugs who made everyday life a misery for the adults around him, but sharp enough to observe their brutality. "It wasn't necessary for a German to be a member of the Nazi party to go up to a Jew and pull his beard," he says in his heavy accent. "They just did. It was like kicking a dog. They did it as a kind of hobby." Sacharin lived in the same city and was equally aware of the Nazis' viciousness. Now a sharp-eyed and assertive woman, she was equally single-minded as a youngster. With her father in jail, she decided she wanted to see the evil of Nazism with her own eyes, and went off to witness Hitler in full cry at a rally in Berlin. "We just stood there, onlookers," she remembers. "Hitler spoke - he shouted, really - and Goebbels too. The effect was electric. I don't think people can understand it unless they have been part of theatricals like that. People were mesmerised, just as I was as I stood there and listened to that harangue. Once Hitler had finished, they sang the anthem and all that rubbish while the army marched away. I was pulled along by the crowd. There were huge numbers of people, all of them hysterical because they wanted to see the Führer. They absolutely pleaded to see the Führer," she says. "I was standing in the first row, just in front of the balcony, and then Hitler, Himmler and Goering appeared. It was unbelievable. When I looked at Hitler, I could see there was that smirk there, which said, 'I've got you where I want you'. People were going absolutely mad." For Sim, who grew up in the town of Kassel, memories of a happy home are coloured by meetings with Nazis. She remembers walking by the Fulda river with her father. "We met a Brown Shirt and his wife and daughter. He came up to my father and said, 'My daughter wants to go in the Fulda. Your daughter will come with her.' I know now that it was very dangerous, but at the time I didn't know why my father had to say yes. We kids ended up in the water and had to be rescued. When I got home, my father told me for the first time about what it meant to be Jewish, and how we had to be very careful," she says. The Nazi era scaled its first ghastly peak on Kristallnacht, November 8 and 9, 1938. In an widespread act of organised brutality, 1,668 synagogues and countless businesses and homes across Germany were ransacked by stormtroopers and their civilian supporters. Some 91 Jews were murdered, and in the aftermath many thousands were sent to concentration camps. Any lingering hopes that German Jews might be able to survive the Nazi regime were obliterated. 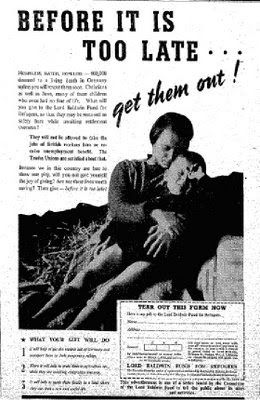 The British Jewish Refugee Committee secured a debate in the House of Commons, when it was agreed that an unspecified number of children up to the age of 17 would be admitted to the country. The first Kindertransport arrived a month after Kristallnacht, the last in September 1939. The children were dispersed all over the country, taken in by foster families or cared for in orphanages and children's homes. It was initially assumed that Britain would be a first port of call, and that these refugees would be settled elsewhere. The children would move on "to Palestine, America or the Colonies", reported The Scotsman, as the first of them - including Sacharin - arrived in Edinburgh. The outbreak of war derailed that notion and six years later, after the final defeat of the Nazis, most chose to stay in Britain. The years since have not been easy. From the outset, everything was coloured by that first full realisation of the death camps and their six million victims, revealed in cinema newsreels. For those who had fled, there was an extra dimension to the tragedy - a sense of loss and guilt. Sickened and astounded by the images, says Metzstein, "You always wondered if you might have been among them. You were always looking among the dead to see yourself." Sacharin agrees. "Very often I hear this voice saying, 'Why me?' I get quite emotional about it. I sometimes think, 'Have I done enough to deserve this?' There is a sense of guilt. It is not easy." Many survivors have a sense of rootlessness, she says. She seems self-possessed, a wife and mother with a successful career behind her. Yet she confesses to feeling insecure. "When people ask me who I am I find it difficult to answer," she says. "I don't know how to reply when they ask, 'Are you Scottish?' The Scots are a clannish people, and I'm not part of that. I wonder what am I, who am I. I don't know." However, Metzstein is more confident. "I have no feeling for Germany at all," he says. "People ask, 'Would you ever go back to Berlin?' I never 'go back'. I visit. Only when I am going back to Glasgow am I coming home, because I am confirmed Glaswegian - all my life, effectively." Nobody needs to ask if he is Jewish, he adds. They know instantly. Part of it is to do with his accent, which he says he could happily do without. "Every time I get in a taxi in Glasgow, the driver says, 'Where do you come from?' Usually I ask, 'How old are you - 50?' Then I say, 'Well, I have been here much longer than you, my friend.'" Sacharin laughs. "People do ask that. To shut them up I say I'm from Ballachulish." But for all the laughter, that there is a note of anti-semitism in some people's attitudes still riles them. But overriding everything is the cost of the 20th century's vilest aberration - the human loss and its consequences for the survivors. Sim has spent years looking for clues to her parents' fate, and to this day admits that she still cannot reconcile herself with their deaths. "You know, I don't even think I believe it now," she says. "I just couldn't believe it. Even when I was grown-up and married, I kept thinking there must have been a mistake." Rosa Sacharin remembers her parents discussing whether they should leave Germany. "My father said, 'I don't want to leave - these are such intelligent, cultured people. This will all just pass over.' He was a dreamer. My mother was much more worldly wise. 'It will end in tears. We should go,' she said." The passing of Hitler's Nuremberg laws, in September 1935, delivered the first devastating blow to the family. Sacharin's father owned a tailoring business that employed 20 people, and he was soon taken into custody. "He was arrested as an enemy of the state. Jews were not allowed to employ non-Jews," she says. "My father had a small factory, and that was enough. He wasn't convicted of any particular crime. It was a means of confiscating what the Jews had." Her father was tried and imprisoned, and she never saw him again. Sacharin watched the devastating impact of Kristallnacht, and was conscious of the growing clamour among the Jewish community to leave Germany. Then, out of the blue, she was told she would be leaving on the first Kindertransport, in December 1938. "I was told one day that I was going. That was it. I had no idea where to. I was told, 'Go to school and tell your teacher you are going away.' At the time, everyone was desperate to get out. I went to the school and said it was my last day. The teacher said, 'Why you?' I didn't know why me. I felt utterly lost. All I knew was that everyone was desperate to get out. "Early the next morning, we went to the station and waited until our names were called out. There were no parents there. We were all told to get on to the train. There was not a sound. I felt utterly lonely as I became aware of the gravity of the situation. It was then that I cried. The moment I stepped on to that train, my world collapsed. "I had only a tiny case. I remember the SS men came to look at our things. One opened my case and there were sanitary towels inside. I wished the ground could have swallowed me up - the stupid man had to show them. But on this train full of children, there wasn't a sound. Eventually, the soldiers left, and the moment we crossed the Dutch border, all hell broke loose." Suspicion, rudeness and anti-semitism dogged the children even after their arrival in Britain. The first refugees were sent to a holiday camp in Essex, where they were given English lessons while foster families were found for them. None of the first group of children had homes to go to before they arrived. But, says Sacharin, "[The British authorities] had to get us out quickly because the next transports were coming. They said they wanted to send me to Palestine, Ireland or Australia. I wouldn't go. They had nowhere to put us. "All the time people would come in to look at us. A man came into an English lesson once and said, 'Stand up, little girl.' I stood up. 'Are you Jewish?' he asked. 'Yes. Pity.' And he chose someone else. This happened constantly. The little ones with fair hair and blue eyes were picked. But I was 13. It was extremely difficult. Eventually the Edinburgh Jewish community decided they would take 13 of us, because we had to move on - more children were coming." "I had a happy childhood in a town called Kassel," says Dorrith Sim, who has on her lap two albums of photos taken by her father in the 1930s. "I have pictures of myself on skis - I must have been five or six - and I had to go away when I was seven. But after Kristallnacht, if there were ever children playing outside I wasn't allowed to go out. I can't remember if I ever went back to my school, because the Nazis had made such a mess of it. "What I do remember is that my mother and father wanted me out of the country. We went to the town hall many times to try to get my papers, but we were always told, 'Your daughter's papers have not yet arrived.' It was July 1939 before I could leave. This is all she can remember of the journey. "My parents took me to Hamburg station. I had a red bag and I was carrying a toy dog called Droll under my arm. My parents had to stand behind a barrier - they weren't allowed on to the platform. Just before I got on the train, I dropped the dog and it slipped down underneath the wheels. Everyone was crying, but I was crying the loudest. I was howling. Then one of the helpers climbed down and got the dog for me, and instead of putting me straight into the carriage he took me back to my parents to say goodbye again. I didn't realise then that it would be for the last time. "When I went into the carriage there were some older girls in there playing cards. It seemed so strange," she says. "I sailed to Harwich and then went on the train to London, where my foster parents found me." Sim's new guardians, Fred and Sophie Gallimore, then took her to their home in Edinburgh. Sim returned to Kassel for the first time on the 50th anniversary of the Kindertransport. "My picture was in the Jewish Chronicle, and I had some letters. One was from a woman called Helen Cartledge, who had stayed in Kassel throughout the war. She had met and married a soldier and moved to Britain. She wrote to me and said, 'The first thing I want to ask is your forgiveness - for what my race did to your race.' She said that if my husband and I ever went over to Kassel they would find the house I had lived in. "So I returned to Kassel, and everyone there was very kind. Our house was still there, and I managed to get a look around it. It looked just like it did when I left, a lovely house with a balcony. "At the town hall, we were given an enormous book, The Jews in Kassel. Before the war, there had been 3,200. Now there are 40 to 60. The people there tried to find out what had happened to them all. I was able to discover that my parents had been sent to Frankfurt in 1942, and from there to Auschwitz," says Sim. She has been back to Kassel since, she says, and is returning this summer with her son and daughter-in-law and their baby. "I've made a number of good friends there. I'm looking forward to it. But the first time was difficult. I've forgotten most of my German, but I tried to speak to some people I met on a tram, to tell them what had happened to me. And getting on a train was hard - the caps that the porters were wearing frightened me. It must have been a bad memory." Dorrith Sim is a children's writer. Her book In My Pocket is an account of the Kindertransport. She lives in Ayrshire. Isi Metzstein's parents left Poland in the 1920s because violent anti-semitism was a fact of life in that country. In those days Berlin appeared to offer a beacon of hope. "Germany was seen as one of the great radical places," he says. "They thought they were moving to a very liberal, modern country that was far removed from the constraints of Poland." But in 1933, Metzstein's father died in hospital during a routine operation. His mother was left to feed a family of five. It was hard for her, says Metzstein, and the Nazis provided "a bad background". Still, he says, his own life went on fairly normally. But then came Kristallnacht. "The next morning I went to school as usual," he recalls. "As I approached, I saw smoke and was intrigued. Other children told me that the synagogue had been set on fire and that the fire had spread to the school. Still, I didn't feel threatened. It was a day, an event in my life calendar. Later I recognised it for what it was, but as children we weren't bothered." Kristallnacht confirmed the dangers for Jews in Germany. "Jews were meeting in the street. I was just a boy, listening, and they were asking, 'When and where are you going?' That was the conversation - it was a major preoccupation in my family and in other families. "My mother and my older sister began making every effort to get out of Germany. We had no other family there, so there was no sentimentality about it. Get out. There was no choosing or picking. We went when we had the chance, and for me that was to Scotland, to a family. My older brother was about to turn 16 - when adult laws would apply to him - and he was sent on a special scheme to England. My mother and my older sister, who was 17 or 18, went into service in a stately home in Dorset. "We could have all gone to Dorset, but my mother thought it would be safer if we went separately, in case war broke out. This helped alleviate a little of the child's anxiety, because we knew that my mother and sister would be getting to England. And it was a smooth passage." Permission for Metzstein's journey had yet to be granted by the Nazis. "I had to go with my mother to a big house in west Berlin," he remembers. "Sitting on both sides of long desks were SS officers in uniform. You had to go from one to the other - it was all very correct, a civil service kind of approach." Travelling on the Kindertransport was one of the most exciting things that had ever happened to the 11-year old boy. "Once we had got over the immediate trauma of separation, we started enjoying ourselves. Two hundred miles, and 40 or 50 children travelling as ordinary passengers. I can't remember who shepherded us off in Hamburg, but we got on this marvellous big boat and we ran wild. We went screaming through the corridors. For three days." After the SS George Washington had docked in England, Metzstein set off for Scotland. "My brother, who had been living in London, met me and saw me off at Euston station. There were six of us in the compartment - a sleeper with six spaces. It was all a new adventure. I had never been on a long-distance train before. I remember that my brother gave me a box of matches. All the matches in Germany were safety matches - but these were not. I woke in the night and smelled something burning. My immediate reaction was, 'My matches have gone on fire!' That wasn't the case, but I remember it very well." Homecoming Scotland - hype or bonanza?